Sheridan Elementary – Learning in harmony, lifting achievement, and leading the future. Learning in harmony, lifting achievement, and leading the future. Welcome to Sheridan Elementary School! Sheridan Elementary School, located at 3100 Plymouth Avenue in Lincoln, Nebraska, serves 455 students in Kindergarten through Fifth Grade. Our school opened in 1926 and was named for its proximity to Sheridan Boulevard, which honors Civil War General Philip Henry Sheridan. 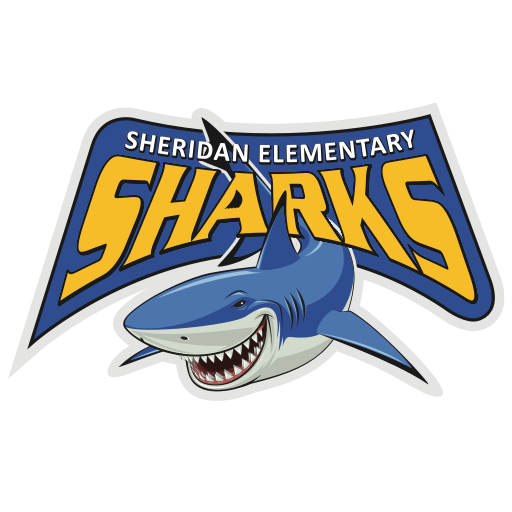 The Sheridan mascot is the shark and our school colors are blue and gold. At Sheridan we engage students, staff, families, and the community to increase achievement and create a safe, respectful, and responsible environment for learning collaboratively. Our teachers are organized in grade level Professional Learning Communities to analyze data, plan instruction, and monitor the progress of each child. Our Specialist teachers provide instruction in Physical Education, Music, Art, Technology, and Library Media resources and work together to support our positive school culture and climate. Community partners, Sheridan families, and staff worked together to create an Outdoor Classroom on our school’s campus. This exciting space creates new learning opportunities outside the classroom walls and beyond the school day. The school’s phone number is 402-436-1167 and our school hours are 9:00 a.m. to 3:38 p.m. If you are interested in before and/or after school care, Family Services provides that service at Sheridan. Please contact Family Services at 402- 441-7949 for information on cost, schedule, and programming. The Sheridan staff, parent group, and students brainstormed “Who We Are” and “Who We Want to Become”. We identified themes and worked together to develop the mission statement: The Sheridan Community. . . learning in harmony, lifting achievement, and leading the future. We want people, who join the Sheridan Community, to understand the vision that is connected to our mission statement in order to enlist their strengths in our important work. We understand that this is a living document and it is open to revision as we learn more together. The Sheridan Community. . . The Sheridan Community, the heart and hub of the neighborhood, is a collaboration of groups and individuals with a sincere commitment to the learning and education of children. We work together and listen to children to support them in setting and reaching their life goals. Learning in Harmony. . .
We educate our community of learners to appreciate diversity, work collaboratively, and value the opinions and ideas of others. We emphasize the importance of modeling good character. We work on goals, support each other, and appreciate the different ways we learn. We are collaborative learners who maximize strengths and support needs in respectful, safe, responsible, and inclusive ways. We cultivate well-rounded learners through the study of the core academics, the arts, environmental studies, health/wellness, technology, and social/emotional earning skills. The Sheridan Community strives to continually set high expectations for individualized academic goals. We collectively honor the Sheridan tradition of academic excellence while working together to forge new paths of learning into the future. We nurture competence, confidence and celebrate achievements. We embrace challenges, persist when we encounter obstacles, focus on effort and practice toward progress and mastery, learn from data and feedback. We find inspiration in the success of others. Leading the Future. . .
We believe everyone in the Sheridan community is a leader and life-long learner. We work together to clarify our mission, vision, and commitments to the future. We model and teach leadership skills then provide leadership opportunities within the school, community, and world to develop positive, productive leaders. We are leading the future by developing healthy life skills, life and career goals, being motivated to make a difference, and experiencing success. We invite you to become an active, positive, and collaborative partner in the Sheridan School Community. Safety is a priority at our school, so all visitors must check in with Mr. Jabr at the front desk when entering Sheridan. As a visitor you are required wear a badge. Also, ONLY the south door is accessible for visitors during school hours. All other doors are locked. If you would like to register your child or have questions concerning registration please call the Sheridan office. By signing this pledge, I understand that I am working towards reducing my schools impact on the environment. Parents may request and the District will provide information regarding the professional qualifications of the student’s teachers and paraprofessionals.